Among marathon runners, who is the Greatest Of All Time (GOAT)? It depends, of course, on your criteria. If you choose only by world records, things are simple. You would opt for Dennis Kimetto (2:02:57) and Paula Radcliffe (2:15:25). If you believe, on the other hand, that the Olympics are the ultimate test, you might select Abebe Bikila. He won successive Olympic Marathons in 1960 and 1964, and set world records in both efforts. There are other good measures, as well. For example: continued excellence through many years. After all, the marathon is an endurance test. Let’s see what runners have produced top results over long periods of time--decades. By this yardstick, Joan Benoit Samuelson leads the pack. On Sunday in Chicago, Samuelson hopes to continue her high-level marathon career by becoming the first woman over-age-60 to break three hours in the marathon. According to the Association of Road Race Statisticians (ARRS), the current world record for a 60-year-old woman is the 3:01:30 that New Zealand’s Bernardine Portenski ran in 2010 at the Gold Coast Marathon in Australia. 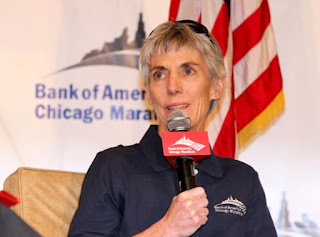 Samuelson has run many other impressive marathons, including two Boston Marathon wins, an Olympic Marathon victory, and her personal best (2:21:21) at Chicago in 1985. After that, she entered a quiet period, raising two children. But she stormed back into the spotlight at the 2008 Olympic Marathon Trials, when she broke 2:50 at age 50. Two-and-one-half years later, at 53, she set a single-age world record at Chicago, running 2:47:50. Her last fast marathon (2:54:26, Boston 2015, at one month short of 58 years) would also be a single-age world record, except the ARRS does not accept Boston for record performances. Benoit’s first fast marathon was a 2:31:23 she ran in New Zealand in 1980. 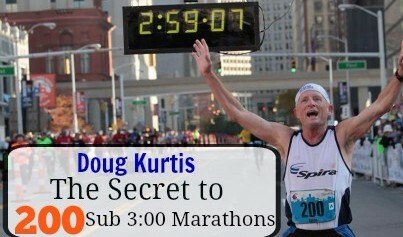 Doug Kurtis’s long marathon career followed a similar trajectory. His first fast marathon was a 2:30:31 at Boston in 1975. Thirty-eight years, six months, and six days later, Kurtis ran a 2:59:07 (at age 61) in the Detroit Free Press Marathon in October, 2013. It was his 200th sub-3-hour marathon, a record. The most interesting question to ask about Samuelson, Kurtis, and other long-performing runners is this one: How much did they slow down per year (or decade, etc)? The following Table shows the basic data. Samuelson has slowed only .43 percent per year (4.3 percent/decade) over 35 years and 2 months. Kurtis slowed .49 percent per year over a longer period, 38 years and six months. Those who remember Ed Whitlock’s incredible marathons into his mid-80s might imagine that he exceeded Samuelson and Kurtis. But, no, at least not on the slow-down-per-year metric. Whitlock’s strong late-life running began with a 2:50:22 when he was 63. Twenty-two years later, he ran 3:56:38 at age 85. No one younger than Whitlock has ever broken 4 hours, but his per-year slowdown rate is 1.73% per year, much greater than Samuelson and Kurtis. Of course, he started much later than they did, and the post-60 years are a far tougher place to begin than the early 20s. Samuelson’s longevity also shines in comparison to the younger U.S. stars in the generation that followed her. Meb Keflezighi will run his final serious marathon this fall in New York City at age 42, and Deena Kastor ran her last fast marathon two years ago in Chicago, also at 42. It doesn’t appear that they’ll be aiming for fast performances in another 20 years. Thus far in 2017, Samuelson’s best race has been a 64:01 in the Cherry Blossom 10-mile in early April. That’s roughly equivalent to a 2:59 marathon. Her other races have been slightly slower, including a 3:12:27 at the Sugarloaf Marathon in mid-May. She ran there primarily to support a friend’s fund-raising.